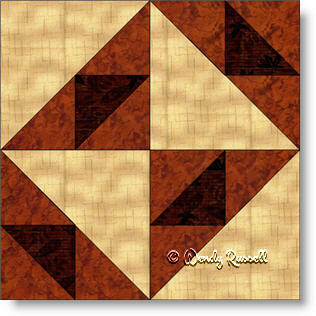 The Nested Triangles quilt block makes good use of the half square triangle patch, because that is the only unit used in the entire block. This quilt block gives you the opportunity to make smaller blocks (although measurements have been given for a 12" block as well) and by simply rotating the blocks in various locations, you can achieve a totally different look, as secondary patterns tend to emerge. The sample quilts illustrated demonstrate how, by using four blocks, with rotations, you create a larger sized quilt block. Use your imagination and test out different layouts to decide on your final quilt.